By 1500 AD, most people in Africa were making at least some of their cloth out of cotton they grew and wove themselves, though they also continued to make bark cloth. 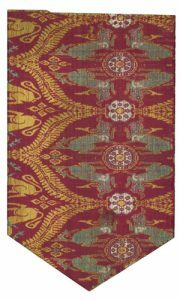 But the most prestigious cotton cloth – the stuff rich people wore and kings gave their followers as gifts – was imported to Africa from India. Indian cotton cloth was expensive, because it had to come on camels‘ backs across the Sahara Desert from North Africa. But soon after 1500 AD, Portuguese trading ships began to arrive in West African ports. They sold much cheaper cotton cloth imported from India. The Portuguese, and later the British, were careful to bring just the kinds of cloth that the West Africans wanted. So they succeeded in getting West Africans to trade gold and slaves for Indian cotton cloth. When Spanish and then British traders began to buy West African people to sell as slaves in South America, and then in North America, they often paid for these people in the popular Indian cotton cloth. The cloth became a kind of money that everyone would accept. In East Africa, too, cotton cloth got cheaper than it had been before, because of all the Portuguese, Dutch, and British ships that joined the Islamic trade between India and East Africa. Still people in Africa kept on growing and weaving cotton cloth for themselves. In the 1700s, people in Africa began to grow the American kind of cotton, which was easier to process. When Eli Whitney invented the cotton gin in 1793, that made cotton thread a lot cheaper than it had been before. European colonists kept trying to get Africans to grow cotton and export it raw so that European mills could spin and weave it. In the end of the 1800s, Europeans used their armies to force people in Nigeria and Chad to grow cotton for them to make into cloth. This exploitation made Nigeria and Chad much poorer, and Europe much richer. But they didn’t get all of it. Africans kept on making their own cotton cloth, raffia cloth, and bark cloth. As machines turned out more and more clothing, clothing became cheaper and cheaper. By the 1900s Americans and Europeans were throwing away tons of slightly worn clothing every year that had gone out of fashion. 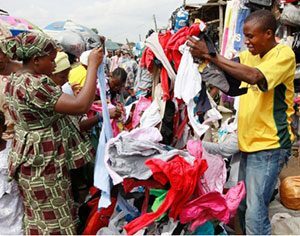 Since World War II, and especially since the 1980s, traders have been bringing that clothing to Africa and selling it in markets there. Many Africans wear Western clothing now. But Africans still grow their own cotton and make their own cloth, when they want something nicer, and some countries, like Zimbabwe, are taxing imported clothes to encourage local production. Did you find out what you wanted to know about African clothing and colonization? Let us know in the comments! Cite this page: Carr, K.E. African Clothing and Colonization. Quatr.us Study Guides, May 22, 2017. Web. April 19, 2019.